How do I fillet a fish? My dad used to fish, so I asked him. He loaned me his fillet knife and a scaler and told me how to use them. He also loaned me a couple of rods so I don't have to fish with the kids' child-sized fishing rods. Which are more my speed, anyway. (That's another thing I have to learn before we go, but I digress.) So I decided to buy a fish and fillet it myself for practice. Today I stopped at Whole Foods and bought an entire red snapper. When the man at the counter asked me if he should scale and fillet it for me, I launched into a discussion of my plan. He very kindly walked me through scaling and filleting the fish, giving me some hope that I can actually do this. I scaled the fish on the driveway. It probably will sparkle for a few days as I'm sure t hat there are still scales out there. But overall that part went fine. 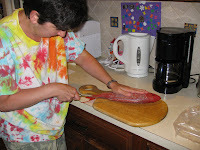 Then I brought it in and tried to fillet it. The knife needed a little sharpening but I followed his directions and ended up with 2 relatively equal sized fillets, with not that much meat left on the bones. Ultimately there were only a few bones and a few scales in the finished product. Which I baked with a mustard-dill-mayonnaise sauce and it was YUMMY. As this is a blog about canning, perhaps you can guess what happened next? I took the bones, head and tail and made stock. After boiling in salted water for 90 minutes or so I strained the stock with a cheesecloth and ended up with 6 pints. Which are currently in the pressure canner. I really hope nothing breaks this time. 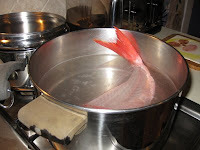 Now, what do I do with fish stock?